Showing 3 articles from November 18, 2015. An old business in Raymond is getting new ownership; the Raymond Furniture Store has recently acquired a new owner, Kaley Hanson of the Pitchwood Ale House in Raymond. When asked how it was that the Raymond Furniture Store was brought to his attention Hanson explained that he had his sights on the store for a couple of years, "I have always been interested in this corner lot. We came in here a couple years ago and talked to Terry and Marion Lewis about the building and they asked me if I'd want to buy the business too." 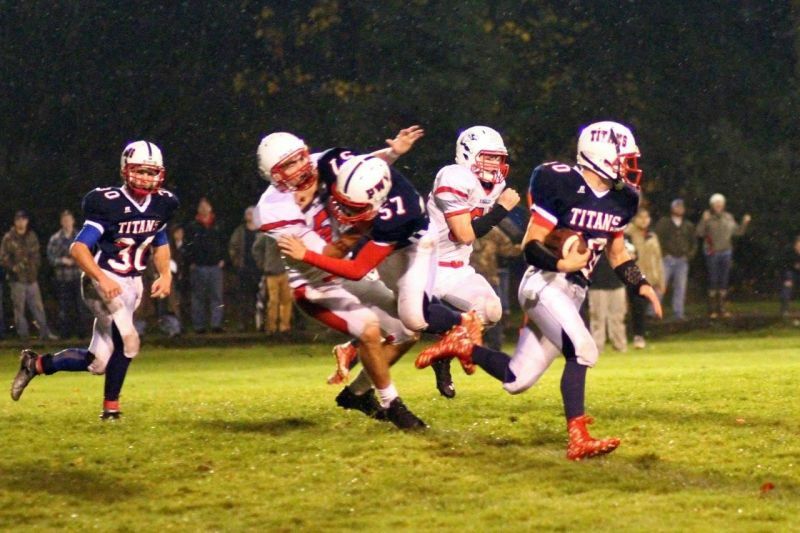 Photo by Larry Bale - The Titans\' Trevor Cook (10) sees the end zone as Dalton Toepelt (57) lays on a no-nonsense block. Cook had 290 all-purpose yards with 3 touchdowns, including one defense. Seth Flemetis is at left. MENLO - Steady rain, nor soggy terrain didn't hamper Pe Ell-Willapa Valley during its Sweet 16 District IV State Playoff 61-21 annihilation of Life Christian Academy before a crowd of about 700 at Crogstad Field Friday night.